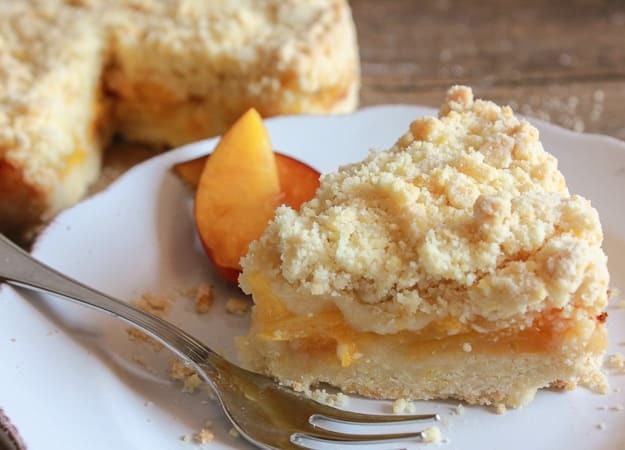 Easy Italian Fresh Peach Crumb Cake, made with fresh or canned Peaches, a deliciously buttery crumb bottom and topping, filled with an amazing Peach filling. 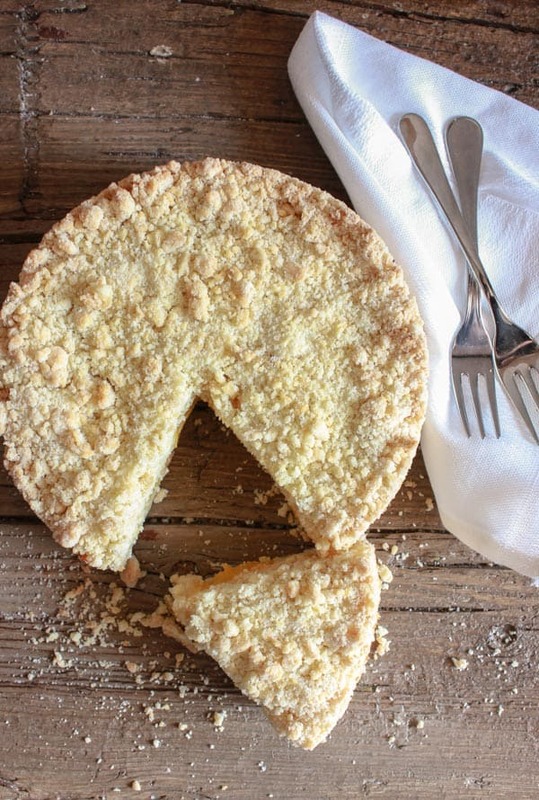 This Italian Fresh Peach Crumb Cake is the perfect anytime Dessert! Do you ever go to the bakery because you are obsessed with one or two of their Baked Goods? Well that was me for years. 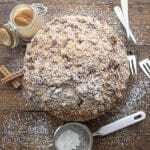 I would buy this amazing Italian Crumb Cake, or better known in Italian as La Torta Sbriciolata. 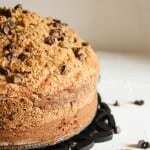 I would usually get the Nutella Crumb Cake because I gotta tell you that is one of the best! And then summer rolled around and we had an over abundance of peaches so why not an Easy Italian Fresh Peach Crumb Cake? I am lucky to have a few friends, like me who like to bake. One day, over coffee, I was served my bakery favourite. Believe me it was even better homemade. After I raved about how much I loved this Italian Crumb Cake and how I could never get enough of it. She told me the recipe, I say told because it always amazes me how Italians just have all these recipes on the tip of their tongue. Needless to say I’m nowhere near as efficient as that, so I never leave home without a pen and small notepad. You wouldn’t believe some of the amazing recipes I have over heard in the grocery store. So since I had all those peaches hanging around, I thought I would give this Crumb Cake a summer feel by filling it with peaches. 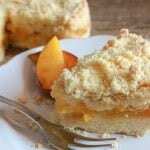 Easy Italian Fresh Peach Crumb Cake is probably one of the fastest cake to make. It’s all crumbs, seriously. 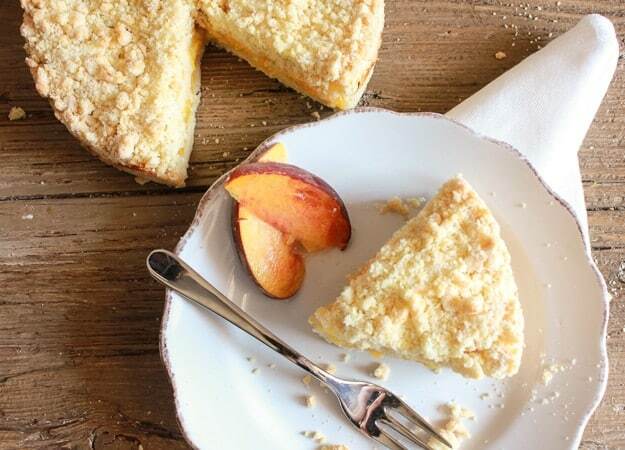 Two thirds of the crumbs go on the bottom of the pan, then add the sliced fresh peaches, top with the rest of the crumbs and into the oven it goes. I served mine with a little vanilla ice cream but why not warm from the oven with a cup of coffee? Now that’s a tasty Summer Dessert. Enjoy! 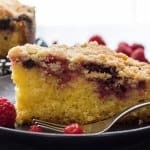 Other Delicious Crumb Cakes you may enjoy! 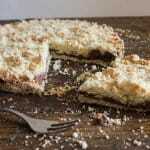 A fast and easy and so delicious Italian Crumb Cake. Pre-heat oven to 350° (180° celsius). Grease and flour an 8" cake pan (20 centimeter). A spring form pan is my recommendation. Add approximately 2/3 of the crumbly mixture to the cake pan, spoon peach mixture on top and sprinkle with remaining crumb mixture. Thank you for the great recipe. I made it for afternoon tea time this weekend my whole family enjoyed it .It turned out excellent. I’ll be making it again ! Hi Maria, thanks so much and so glad everyone enjoyed it. Love this. Can I substitute gluten flour so the cake will be gluten free? Thanks. Rosemary, I think I read all of the comments but did not see this addressed. The recipe says “an 8″ cake pan (20 centimeter). A spring form pan is my recommendation.” but in the video it looks like you just used a glass pie plate. I am going to use the pie plate. Is that the best way? Thanks! Have you ever frozen one of these crumbles? Hi Melissa no I haven’t but I am sure you could. Make sure pie is well wrapped before freezing. Hope that helps. Oh, my goodness. Your recipes never disappoint! I had extra peaches & knew that I could count on you. Many thanks for the recipe. For anyone still looking for an easy way to peel a peach- try immersing the whole peach in boiling water for 30 seconds & then into ice cold water. The skin will come off easily. Thanks so much Katherine, so glad you enjoyed it. Great tip on the peaches. Have a great week. So I have to know what you topped it with in the video????? Kiwi maybe? Do you have recipe? It looks divine! Do I use pie filling and halved peeled peaches? I’m so happy I found this recipe! I admit I’ve gone a little crazy with it, making it each week for the past four weeks. To me it’s the perfect dessert: delicious, easy, beautiful and easy to customize. The only change I made to the recipe as written is to use 8 TB butter. I played around with it a little and found it helped the top brown a little better and, out of sheer laziness, it’s easier to toss in a whole cube of butter than it is to measure 1/3 cup + 1 TB. So far I’ve made it with fresh peaches, lemon pie filling from a can, peach pie filling from a can, and blueberries. Each one was unique and amazing. I haven’t had a failure yet. Thank you for this recipe. I will be making it for years to come. Hi Linda, so glad you enjoy it, haha sorry about the measurement but it was in grams so converting to cups and tablespoons is always a bit of a job. Your ideas sound amazing, if you like Nutella you should try it that way (I actually have a recipe on the blog for it), that is probably the most popular way here in Italy. Have a great rest of the week. Oh my yessssss. I love peaches but especially in a sweet cobbler or cake. The crumble on top makes it! Thanks Meaghan, I love the crumble on top too. Have a wonderful Sunday. 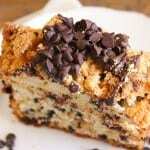 hi, may i know what kind of flour u use in tis recipes-crumb cake?Tks. Hi Yvonne, just regular all purpose flour. Happy Sunday. Hi April, I know so easy and really delicious. Have a great Sunday. Holy delicious! Fresh peach season is right up there with Christmas, in my book and there are never enough good peach recipes to go around. I have never heard of a peach crumb cake before but I promise this is not one that I shall forget. Your photos are amazing and the entire concept is mouthwatering. I can’t wait to try this one; thanks so much for sharing! Thanks so much Dan, yes of all summer fruits peaches are my favourite. I hope you enjoy it. I too am impressed when someone can just rattle off a recipe without referencing notes! I think I can only do that for maybe 3-4 different recipes. Even with those I’m more certain if I’m actually *making* the recipe because I know what to reach for, etc. This definitely looks like a good recipe to have memorized though! Summer cakes are supposed to be beautiful and simple like this. Gorgeous! Hi Mary, thanks and I agree, summer cakes are the best. do you think I can use canned pie filling? Hi Rosemary. My husband just found this post. He said almonds would be good in the mix? so I ground about 1/4 cup of shaved almonds and added to the mix. We’ll see if he is as clever as he thinks???? Hi Bri, sounds good to me, Italians love almonds, so I’m sure it would work. Let me know. Can you make this with rasberry? Hi Tanya I think you could probably make it with any kind of fresh fruit and I think Raspberry would be amazing. Let me know how it is. Just made the cake, it was wonderful! I didn’t have fresh peaches so I used peaches I canned in light syrup, rinsed them off with water and let them drain, didn’t use sugar because they had processed with sugar. Tasted wonderful! Will make this many times for sure. Thank you for sharing! How did you know that I have extra peaches I was trying to decide how to use up? What a simple and gorgeous cake! Printing out the recipe to try this weekend. Hi Laura, now you know what to do with the peaches, hope you enjoy it! Have a wonderful holiday weekend. Sorry, forgot to ask Can I use a 9″ springform pan for this? Don’t have an 8″. Thanks again! Hi Janet, a 9 inch is fine the crust just won’t be as thick. But it will work. Let me know how you like it. This may seem like a dumb question, but I have never peeled peaches. Do you just use a vegetable peeler for this? Thank you! Hi Janet, you sure can, that’s how I do it. If you used frozen peaches, should they be thawed first? Hi Mandi, I would thaw them first and drain them also for about 20 minutes. Hope that helps. my husband loves cinnamon crumb cake from a chain bakery and I imagine this would only be better with the peaches. 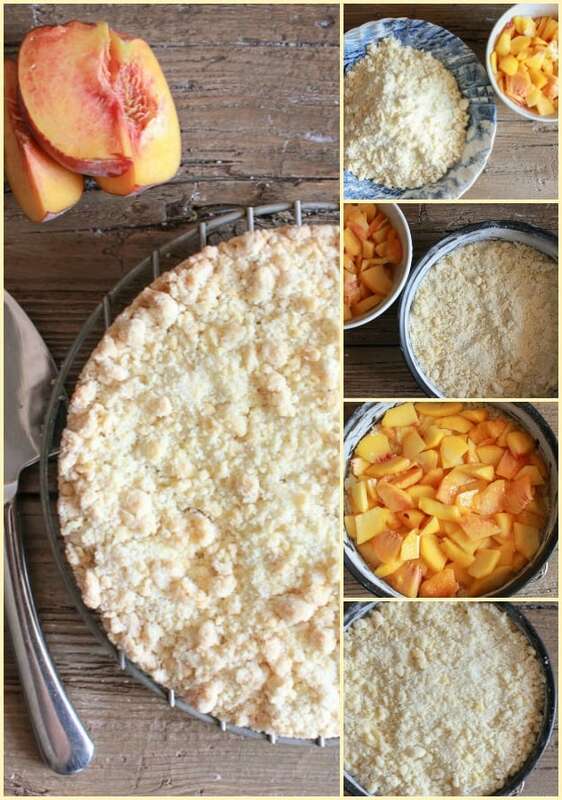 do you press the bottom crust into the pan like a shortbread before you add the peaches or do you leave it loose? Hi Katie, I just placed the peaches on top, no need to press down. Let me know how it goes. Peaches don’t grow in our region so when available by a parking lot truck once a year, I buy them and freeze them. Can I use frozen peaches in this cake? Hi Cheryl, I don’t see why not, I have used canned also, just thaw them and drain them in a sieve for 30 minutes or so. Let me know. Have a great weekend. If you were my neighbor, I would NEVER have to go to the bakery! Your baked goods always looks so incredible! Hi Kristen, I wish you were then I could bake more! 😉 Thanks so much. HI Mary Frances, thanks so much, God bless you too, and hugs. also, I didn’t know you had to peel the peaches, so I just cut them up in thin slices and I also forgot to cut them in half. Will that make a difference? Hi Robyn, I only put a 1/3 butter in the crumb topping, I forgot the extra 1 tablespoon. Will that change the taste or texture of the crumbs? I haven’t tasted the cake yet. Can I store it in the refrigerator? Thanks for sharing the recipe. Hi Chris, no 1 tablespoon shouldn’t make a difference, I don’t think the peaches should be a problem, and yes you can refrigerate it. Have a great weekend. oooops, I’m sorry I don’t do this sort of thing much. Would I store it in the fridge? Thought the crumbs might get a bit soggy? Hi Robyn, no problem, if your house is really hot then yes best in the fridge, it shouldn’t get soggy (mine didn’t). It really doesnt take very much time to make, so if you had time early in the morning, or what you could do is get it all ready the night before (or when you have time) the crumbs and cut up the fruit, leave it in the fridge and then put it together the next day. (remove from the fridge and just crumble up the crumbs before using). Let me know. Hi, can this be made a day ahead? Hi Robyn, I did and then I brought it to a friends. Hi Mariangela, thank you hope you enjoy it. Have a great day. Peaches are just getting ripe here in Michigan. I bought some this weekend and made a peach cobbler but now I wish I would have made this. I’ll have to go back to the farmer’s market this week to make this one. Hi Linda, I love peach cobbler too, let me know how you like it. Does it call for fresh peaches AND a can of peach filling? Hi Robyn, no just fresh peaches. Hi, could this recipe be made with a cake mix? Hi Josie, I really don’t know if you could make this with a cake mix, I never have. Cake mixes are hard to find in Italy. The recipe is really easy and good, give it a try. 🙂 Have a great day. Just made it. It’s in the oven. Top is not getting brown. Should there be more butter in the recipe? Hi Rose, the top shouldn’t be brown it should be lightly golden, the butter was the right amount. Let me know how it turned out. Have a great Sunday. Hi Rosemary, beautiful recipe can’t wait to try it and a big thank you for the metric conversions. Hi Rita, thank you hope you enjoy it! Hi Patty, yes the peaches are peeled, I thinly sliced and then halved them. Have a great day. can the peaches be replaced with anything else? like apples or banana? Hi Nazia, I think apples would be delicious, I would cook them for a bit, check out my filling on my Italian Apple Pie recipe. Bananas I don’t know about that. You need something that has some liquid or syrup, pears would work too. Let me know what you decide. Tried your recipe (added a little extra sugar and a dash of cinnamon to the peaches – we have a real sweet tooth!). Very very yummy!! Thank you for the deliciousness! Hi Tish, so glad you liked it! What a perfect Summer dish! Thank you so much for linking up at Tasty Tuesday! This post has been pinned on the Tasty Tuesday Pinterest board! I love having you and can’t wait to see you next week! Oh yum, this looks delicious! Thanks for stopping by Try a Bite Tuesday, we appreciate you sharing your recipe. Just pinned, shared on g+ & stumbled! I hope you visit again next week. Hi Debra, thanks it’s a great link up. Thanks for linking up to Saucy Saturdays! This crumb cake is too die for:) I’m in Georgia so I can get some fresh peaches!! Hi Angela, thanks hope you enjoy it! Hi J Young, I really couldn’t tell you because I have never made it with gluten free flour, but as they say you never know until you try. If you do decide to try it I would love to know if it worked or not. Have a great day. Who doesn’t like crumb cake? I know in my house we pick the crumbs off first. Thanks for such a great recipe. Have a wonderful weekend. Hi Ann, haha my daughter does the same thing, thanks, have a great week. It certainly looks delicious and I am amazed how my mamma used to make all of these delicious recipes and never have anything written. I guess I am more ties to recipes numbers and quantities. I love crumbly toppings! Will definitely be making this soon. Grazie and buona serata! Your beautiful pictures are making my mouth drool. I will definitely be making this before peaches go out of season. Now, if you’ll excuse me, I have to go wipe up my computer table! I don’t have a springform pan & want to make this for guests this Thurs (8/16/18) Can I use either an 8 or 9″ round cake pan????? Thanks for your help. Hi Ella, yes you can although I don’t think you will be able to remove it from the pan (you can’t turn it upside down), therefore you can serve it from the pan if you don’t mind doing that. Hope you enjoy it.